Eric Holder, attorney general under President Barack Obama, told a crowd that they should not be civil to Republicans but instead kick them. 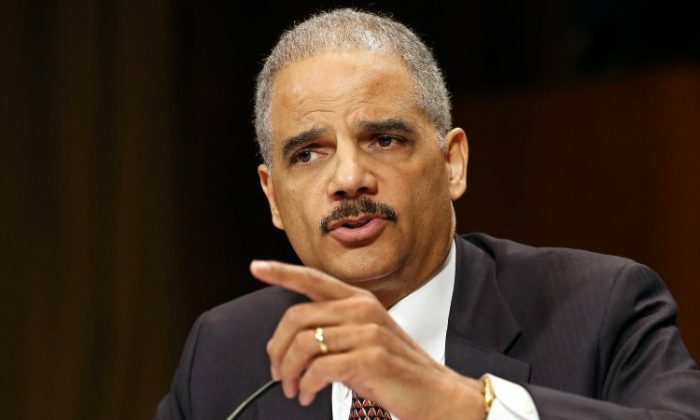 Holder, who was speaking at a campaign event for Georgia gubernatorial candidate Stacey Adams, a Democrat, later said he doesn’t want people to do things that are illegal, although physically assaulting people is illegal. The exhortation is the latest from Democratic leaders telling people to confront elected officials amid a wave of violence and threats against GOP leaders. “That’s why I believe, if we are fortunate enough to win back the House and or the Senate, that’s when civility can start again,” she claimed. He also said that “the other side” was to blame for disruptions at his rallies. Following Clinton’s remarks, Senate Majority Leader Mitch McConnell (R-Ky.) said in a speech on the Senate floor on Oct. 10, that her remarks were encouraging “mob tactics,” reported Fox News. “The far-left mob is not letting up. Earlier today, former Secretary of State Clinton sent this signal as clear as day. She told CNN exactly how she views millions of Americans who hold different political views from her own,” McConnell said. Violence and threats have become more common in the Democratic party and their supporters, with a number of incidents happening recently. On Sept. 24, Sen. Ted Cruz (R-Texas) was dining with his wife Heidi in Washington when a group of far-left people linked to Antifa approached and harassed them, forcing them to leave the restaurant. The pattern of mobs confronting Republican officials in restaurants dates back to earlier this year. Jackson Cosko, who allegedly doxxed—revealed personal details including home addresses—of three Republican Senators, was arrested and revealed on Oct. 3, to be a longtime Democrat staffer who worked for Rep. Sheila Jackson Lee (D-Texas) and Sen. Dianne Feinstein (D-Calif.), among others. William Clyde Allen was arrested and charged on Oct. 5, for sending letters to the Pentagon and President Trump, saying he wanted to “send a message.” The parcels contained castor beans, which are used to make the poison ricin. Sen. Cruz received a similar letter. Samantha Ness, a Minnesota teaching assistant called for someone to step up and assassinate newly confirmed Supreme Court Justice Brett Kavanaugh on Oct. 6, while a writer for Stephen Colbert’s “Late Show,” Ariel Dumas, said she was glad unsubstantiated sexual assault allegations “ruined” Kavanaugh’s life. And Sen. Susan Collins (R-Maine) was threatened and yelled at during the Kavanaugh confirmation battle and after she announced her support for him. Democrat leaders have for the most part not condemned the violence and threats; a number have done the opposite, besides Clinton and Holder. Sen. Cory Booker (D-N.J.) told supporters in July to “get up in the face of some congresspeople”, a call condemned by the wife of Sen. Rand Paul (R-Ky.), who recently revealed she’s taken to sleeping with a gun because of the threats she’s received. Rand Paul was attacked in his home in Nov. 2017.